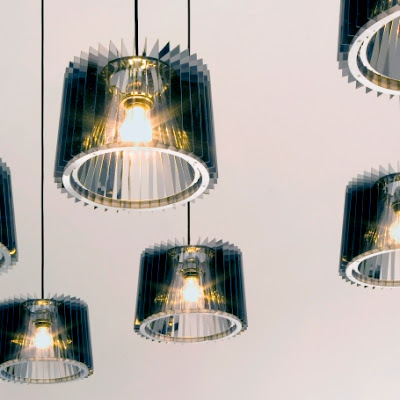 Bad Boy British designer Tom Dixon has a new lighting series out called Punch, this includes the above polished stainless steel pendant lights, as well as table lights and wall lights. I love the line even more than his widely popular 2005 Copper Shade Pendant lamps I think. At first Punch suprised me a little as it didn't seem all that Dixonian to me. If fact, I thought it looked like a metallic Kartell collection. 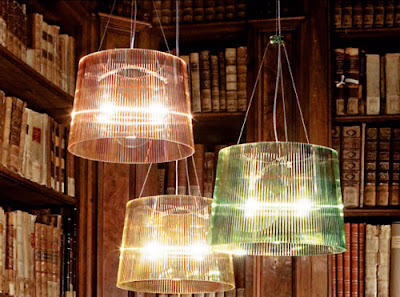 (Below is the 2005 polycarbonate Ge suspension lamp by Ferruccio Laviani for Kartell that I immediately thought of). The more I looked at it though, the more I liked it and was taken aback by the delicate yet bold metal work. I can't wait to see it in person and really take a good look. The Punch table lamp is available for purchase here for $435, I will keep you updated on other purchasing locales once the collection is more readily available.